We are well into 2016 but here at Gamomo, we wanted to stop and share a few of the exciting projects we launched in 2015. The first of which was our partnership with FIFA and the Canadian Soccer Association for the 2015 Women’s world cup. 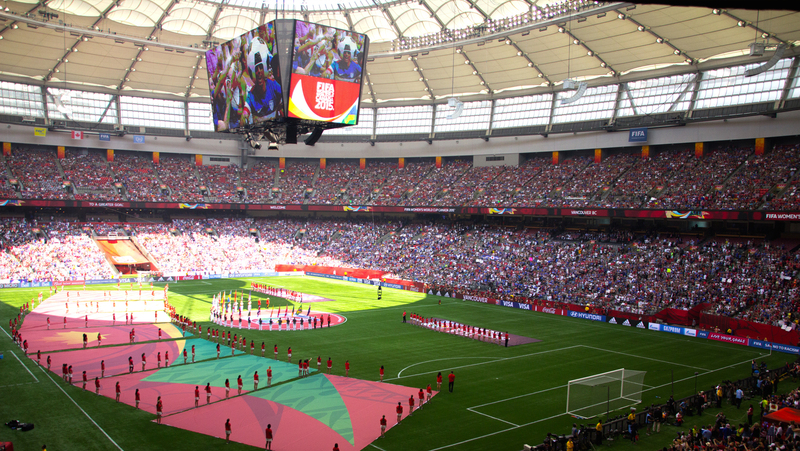 Held in Vancouver last summer, we were responsible for creating all of the animations for all the stadiums banners across Canada with FIFA Branding. We had three months (May-July 2015) to complete a project that would be watched by thousands in the stadiums and seen by people around the world on T.V. Because FIFA is a very high profile client, they were heavily involved in every single step of the process and their expectations were high. The visuals had to be high energy, subtle and somehow non-distracting to the crowd watching the game. The animations consisted of a series of loops that ran throughout every game and played on 3 different stadiums across Canada. A total of 30-35 loops were created from the beginning of the cup until the end of the world cup. Along with the regular loops, we also created an additional 10-15 videos for the championship celebration.